Sheffield is a modernised industrial city, founded on the cutlery and iron & steel trades which came to the fore during the industrial revolution. Click here for our Abbeydale Industrial Hamlet section - the former industrial complex where steel was turned into tools. Click here for our Kelham Island Muesum section - an industrial museum where steam and gas engines, traditional workshop craftsmanship, cutlery manufacturing processes and many similar industrial machinery may be seen. Traditional Heritage Museum - this museum has many displays and artefacts which illustrate life & work in Sheffield from 1850 to 1950. Open to parties of visitors by prior arrangement & open to the public on specified dates (see What's On - Other Special Events for Open Days). Situated at a former church hall of Endcliffe Methodist Church, entrance on Ecclesall Road. See their TH Museum Web Site for more details. On the road to Rotherham from junction 34 of the M1, you will find the Magna Science and Adventure Centre. Click here to read more about Sheffield' s Industrial History. Click here for our section on Bishops' House. Built in about 1500, is the oldest surviving timber-framed house in Sheffield. There is a Fire & Police Museum (0114 249 1999) showing many old fire engines and fire-fighting machinery through the ages. Open Sundays and Bank Holidays. See the Fire Museum Web Site for more details. If you remember the old Sheffield buses, take a trip back in time to the Sheffield Bus Museum. Click for our section on Sheffield Ski Village, Europe's largest artificial ski park. Sheffield has the Mappin Art Gallery and City Museum (Tel: 0114 278 2600, Fax 0114 278 2604) at Weston Park, the Graves Art Gallery (Tel: 0114 278 2600, Fax 0114 278 2604) at Surrey Street and the Millenium Galleries on Arundel Gate. E-mail info@sheffieldgalleries.org.uk or try their web site at Museums-Sheffield. The Mappin Gallery is the home to paintings from the City's collection dating from the 16th to 19th century, and is a major regional venue for cutting-edge contemporary art. At the City Museum visitors can discover Sheffield's fascinating archaeology, natural history, decorative arts and Social History collections. Open Tues - Sat 10am - 5pm, Sun 11am - 5pm, Bank Holiday Mondays 10am - 5pm. Free admission. At the Graves Art Gallery you can see Sheffield's outstanding collection of British and European Modern Artm including works by famous artists such as Matisse, Picasso and Cezanne, together with a range of first class touring exhibitions, chosen to compliment the permanent displays. Open Mon - Sat 10am - 5pm. Free admission. The Millenium Galleries is an inspiring new venue for visual arts, craft and design in Sheffield. Visitors can see blockbuster touring exhibitions, contemporary craft and design, the Ruskin Collection and displays of the city's internationally important Metalwork Collection. Open 7 days. Check the What's On page for details of special exhibitions. Also in the centre of Sheffield is the Site Gallery (1 Brown Street). Site Gallery is an international centre for contemporary art, offering a changing exhibitions programme backed up with regular publications and a comprehensive calendar of conferences, artists talks and events. The Cupola Gallery (178a Middlewood Road, Hillsborough) is a lively and friendly venue with a reputation for quality exhibitions and innovation. Cupola hosts approx. 10 exhibitions a year and shows a constantly evolving collection of contemproyart and craft. Open Mon-Sat 10-6. Free admission. Blocspace Studios - with regular exhibitions and a place to work for local artists in the centre of the city. Yorkshire Artspace - modern visual arts and crafts on display. Work studios for artists. Regular exhibitions, activities and workshops. Located central Sheffield. Not far from the University of Sheffield, are the Botanical Gardens. Click here for our Botanical Gardens section. Just to the south of Sheffield is Renishaw Hall Gardens of Italian style displaying colourful bushes and immaculately trimmed hedges. Best time to visit seems to be in the summer months. Click for Official Renishaw Hall Gardens web site. 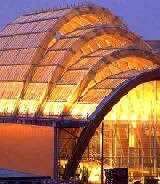 Sheffield's impressive Winter Gardens is one of the largest temperate glasshouses to be built in the UK during the last hundred years and will create a stunning green world in the heart of the city. Appearing next to the Millennium Galleries is the Winter Gardens.The gardens contain 150 different species of plants, and 2,500 plants in total. There are also shops as part of the development. A florist, a specialist plant shop, a private gallery and a coffee shops complement the gardens. The gardens are 21m high, 70m long and 20m wide. They cover 2,500 square metres of glazing, using 128 roof vents. Inside there are 150 species of plants and 2,500 plants in all. This is the first winter gardens to be commissioned for more than 100 years. The Winter Garden and Millennium Galleries were designed together by the same team, Pringle Richards Sharratt Architects. They were conceived to be a cultural route running through the middle of the city, surrounded by other buildings, leading to the Peace Gardens. 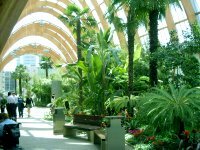 The Winter Garden opened to the public on 12 December 2002 and was officially opened by Her Majesty The Queen accompanied by HRH The Duke of Edinburgh on 22 May 2003. Entry to Winter Garden is free, and it is open seven days a week, 364 days per year, from 8.00am - 6.00pm. The Winter Garden houses three specialist retail units: Flowers in the Window; The Bessemer Gallery; Zooby's Fair Trade Sandwich Deli. The Winter Garden also houses the Visitor Information Point. Starting at the Victoria Quays Canal Basin, you will find moorings, food and drink and within a short walk, the city centre with all its shopping facilities. Within the city limits, the canal passes the Don Valley Stadium, Sheffield Arena and the Meadowhall Shopping Centre. There are opportunities for fishing, walking, and boating. The towpath is an opportunity for some leisurely cycling permitting the studying of some urban wildlife. This whole area has been revamped over the recent years and the canal, which had formerly fallen into decline, is now fully navigable. Sheffield Guide - Sheffield map & Miniguide. @UK - an excellent UK travel guide with many local and national links. Barnsley Tourist Information Centre - 46 Eldon Street, Barnsley, S70 2JL. Tel: 01226 206757. Graves Park Balloon Festival - annual event (usually late July) with balloons, kites, a funfair, craft fair, stalls and other attractions. Sheffield Cathedral (0114 275 3434) dates back hundreds of years and is well worth a visit to view its various architectural features from the 15th to 20th centuries. The city centre's only medieval building. Grade I Listed building.